This online tool was designed to provide DND civilian employees a general understanding of military culture and environment so they are better equipped to support military operations. Other persons may also find this publication of interest. Cet outil, que l’on trouve en ligne, a été conçu pour fournir aux employés civils du MDN une compréhension générale de la culture et de l’environnement militaires afin qu’ils soient mieux équipés pour appuyer les opérations militaires. Cette publication pourra sans doute intéresser d’autres personnes. 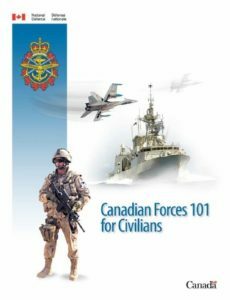 The purpose of The Guide is to provide serving and retired Regular and Reserve Force members as well as their families with an overview of benefits, programs and services to which they may be entitled in the event of a member becoming disabled, ill, injured or deceased while serving in the Canadian Forces (CF). L’objectif du Guide consiste à donner aux militaires actifs et retraités de la Force régulière et de la Force de réserve ainsi qu’à leur famille un aperçu des prestations, des programmes et des services auxquels ils peuvent être admissibles en cas d’invalidité, de maladie, de blessure ou de décès survenant pendant leur service dans les Forces canadiennes (FC). 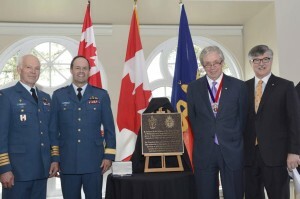 From left to right, Major-General (ret’d) Pierre Morisset, History and Heritage Advisory Committee, Royal College of Physicians and Surgeons of Canada, General Tom Lawson, Chief of the Defence Staff, Dr Cecil Rorabeck, President, RCPSC and Dr Andrew Padmos, Chief Executive Officer, RCPSC, are on hand in Ottawa on May 14, 2014, for the unveiling of a plaque to honour the Fellows of the RCPSC who serve, or have served, in the Canadian Armed Forces. The Canadian Forces’ highest award for non-military personnel was presented today by General Tom Lawson, Chief of the Defence Staff, to the Royal College of Physicians and Surgeons of Canada in Ottawa. The Medallion for Distinguished Service and accompanying certificate were presented to Dr. Cecil Rorabeck, OC, MD, FRCSC, President, and Dr. Andrew Padmos, MD, FRCPC, the Chief Executive Officer of the Royal College. Les Forces armées canadiennes reconnaissent le Collège royal des médecins et chirurgiens du Canada pour son service distinguee. De gauche à droite, le Major-Général (ret) Pierre Morisset, Comité consultatif sur l’histoire et le patrimoine – Collège royal des médecins et chirurgiens du Canada, le Général Tom Lawson, chef d’état-major de la Défense, le Dr Cecil Rorabeck, président du CRMCC, et le Dr Andrew Padmos, président-directeur général du CRMCC, à Ottawa le 14 mai 2014 pour le dévoilement d’une plaque en l’honneur des membres du CRMCC qui servent, ou ont servi, dans les Forces armées canadiennes. Le général Tom Lawson, le Chef d’état-major de la Défense, a aujourd’hui remis la plus haute distinction pouvant être décernée à des civils par les Forces armées canadiennes au Collège royal des médecins et chirurgiens du Canada, à Ottawa. Le médaillon pour service distingué et le certificat qui l’accompagne ont été présentés au Dr Cecil Rorabeck, O.C., M.D. FRCSC et président, et au Dr Andrew Padmos, M.D., FRCPC et président-directeur général du Collège royal. Canadian Forces Health Services Group Headquarters has confirmed that former members of the Royal Canadian Medical Service and Royal Canadian Dental Corps may be authorized to wear Mess Dress for functions where Mess Dress is the order of dress required for still serving members. For former members of the RCMS residing East of Thunder Bay, ON, applications for approval are to be submitted to Commander 4 Health Services Group in Montreal. For those residing in or West of Thunder Bay, applications for approval are to be submitted to Commander 1 Health Services Group in Edmonton. Former members of the RCDC are to submit their requests to the Director of Dental Services at Canadian Forces Health Services Group Headquarters in Ottawa. The forgoing aside, the uniform is one of the most powerful visual expressions by which the public image of the Canadian Armed Forces is fashioned. As such, prior to authorizing such requests, the approving authority must be confident that the requesting individual’s personal appearance and behaviour would not reflect negatively on the CFHS or CAF. In making this determination, approving authorities should remind requesting individuals that they should be conforming to the same appearance regulations by which still serving personnel are bound. Following a comprehensive self-assessment completed by CF H Svcs Gp personnel, a total of twenty Accreditation Canada surveyors visited CF H Svcs Gp medical facilities and the HQ from 7 – 12 April and again from 2-7 June 2013 to analyze first-hand CF H Svcs Gp’s programs and processes. As the last Canadian organization to transition to Accreditation Canada’s Qmentum program, CF H Svcs Gp successfully met the majority of the criteria evaluated. The final report from Accreditation Canada is currently being edited and should be available for dissemination within the next few weeks. We are currently reviewing the report and identifying specific actions to address some of the recommended improvements to our medication reconciliation, laboratory, and falls prevention programs. A follow-up report will be submitted by the HQ in November 2013 identifying progress in meeting Accreditation Canada’s standards of excellence. Any questions or comments to be directed to Ms. Shoba Ranganathan, National Quality Improvement Manager (CSN 945-6779 or Shoba.Ranganathan@forces.gc.ca). Après une auto-évaluation complétée par les personnel du Gp Svc S FC, untotal de vingt visiteurs d’Agrément Canada ont visité les établissements médicaux et le QG le 7 à 12 avril et aussi le 2 à 7 juin 2013 pour évaluer les programmes et les processus du Gp Svc S FC. Comme la dernière organisation canadienne à la transition vers le programme Qmentum d’Agrément Canada, le Gp Svc S FC a rencontré avec succès la majorité des critères évalués. Le rapport final d’Agrément Canada est actuellement en cours de modification et devrait être disponible pour la diffusion dans les prochaines semaines. Nous sommes en train d’examiner le rapport et identifier des actions spécifiques pour répondre à certaines des améliorations recommandées à nos programmes des bilan comparatif des médicaments, laboratoire, et la prévention des chutes. Un rapport de suivi sera présenté par le QG en novembre 2013 pour identifier notre progrès à répondre aux norms d’excellence d’Agrément Canada. Si vous avez des questions ou des commentaires, veuillez contacter Mme Shoba Ranganathan, Gestionnaire nationale de l’amélioration de la qualité (CSN 945-6779 ou Shoba.Ranganathan@forces.gc.ca). At the semi-annual meeting of the Committee of the Chiefs of Military Medical Services at the North Atlantic Treaty Organization (NATO) headquarters in Brussels, the Dominique-Jean Larrey Award was awarded to Canada for its establishment and command of the NATO Role 3 Multinational Medical Unit at Kandahar Airfield, Afghanistan, from 2006 to 2009. It was the first ever NATO multi-national field hospital involved in combat operations. The Dominique-Jean Larrey Award is the highest honour for medical support that NATO bestows. It is awarded in recognition of a significant and lasting contribution to NATO multi-nationality and/or interoperability or to improvements in the provision of health care in NATO missions within the areas of military medical support or military healthcare development. This is only the second time the award has been granted. This award was received by Brigadier-General Jean-Robert Bernier, the Canadian Forces (CF) Surgeon General, and Colonel Jacques Ricard, the first Commander of the medical unit. The CF were honoured for their outstanding leadership and the extraordinary clinical success throughout the mission, with the highest survival rate for war victims recorded to date. The CF were also commended for their ground-breaking work in integrating multinational health teams comprised of military and civilian personnel from partner nations, including Australia, Denmark, the Netherlands, New Zealand, the United Kingdom and the United States. “It is with great pleasure that I extend my personal congratulations to the Canadian Forces Surgeon General and the men and women who led and served at the NATO Role 3 Multinational Medical Unit for almost four years of operation from 2006 to 2009,” said the Honourable Peter MacKay, Minister of National Defence. “With the strong support of the Canadian Joint Task Forces and the Canadian Forces operation commands, the Canadian Forces Health Services team and augmentees from allied forces provided exemplary health care throughout the mission and the Role 3 was considered one of the world’s best trauma facilities. Under the Canadian Forces’ leadership, NATO casualties who made it to the Role 3 with vital signs had a 98 per cent chance of leaving the hospital alive.” “The health of our men and women in uniform is a top priority for this government and this award is a testament to the quality of care we provide,” continued Minister Mackay. “The international leadership and professionalism exhibited at the Role 3 hospital emphasize that our health services personnel are among the best in the world, and the overall success of the unit is a tribute to all its members.” “With the support of many Canadian Forces elements, the Role 3 Multinational Medical Unit provided superb advanced surgical and medical care to coalition, Afghan civilian and enemy casualties in an extremely difficult environment and under threat of attack. Over 800 Canadian Forces Health Services personnel worked there with coalition partners during the period of Canadian command,” said Brigadier-General Bernier. “This award is a testament to the extraordinary dedication and professionalism of the Canadian and allied military and civilian personnel who served there. The team always maintained the highest ethical and clinical standards in treating our patients and in mentoring Afghan military health personnel. This is a very proud day for Canada and for the Canadian Forces Health Services.” The CF, with the support of their health care partners, are committed to providing full spectrum care and the highest standard of health care possible to Canada’s military personnel, wherever and whenever they serve. As part of this commitment, on September 12, 2012, Minister MacKay announced an additional $11.4 million to augment mental health care and preventive programs in the CF. This initiative, spearheaded by Minister MacKay, brings the CF’s annual health care budget to approximately $440 million.